You remember those billboards in Minority Report, the ones that personalize what they display depending on who stands in front of it. 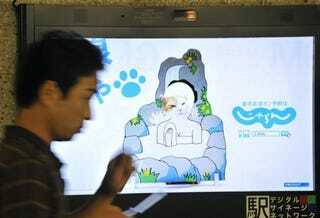 Tokyo is rolling out digital billboards that do the same thing. In Tokyo, the billboards are outfitted with cameras that can determine the gender and age group of any passerby who takes a look at them. Even if you just glance at them, the digital billboards only need a second to figure out if you're a young girl who would like Hello Kitty or an old man who would want a young girl. They promise they're not recording anyone but they are collecting data to better target those old, so 2009 print billboards.